The mission of the Minecraft and More….. Unsymposium is to continue the discussion that began at the ISTE 2013 Conference at San Antonio. The most popular virtual world or game (depending on your viewpoint) was this lego looking, easy to navigate 8 bit digital sandbox. The Fall Games MOOC from Colorado Community College is exploring making, hacking and gaming during this iteration. Minecraft is the maker movement online and the UnSymposium will be hosting a building event – the Minecraft Challenge created by the rgMOOC. Our purpose is to bring a group of educators together to discuss, plan and play in Minecraft. We have activities starting on the top of the hour. We will be livestreaming all events through Google Hangout. Please be patient if we do not start exactly on time. We will be ending at 45 minutes after the hour to ensure time to setup the next Google Hangout. On Friday night, we will not have events on the Minecraft servers, but on Saturday you are invited to log into the Games MOOC server. If you would like to participate in events on the Minecraft servers, you will need to email games.mooc@gmail your Minecraft character name by Friday evening. The server is whitelisted so we will need to add you. The servers are using version 1.6.4, so you will need to make sure your account is set to 1.6.4. On Friday at 6 pm ET, we will begin with a very quick welcome and then start with a tour of Morrowcraft with Marianne Malmstrom. We don’t know a better way to start this UnSymposium than with a tour of a highly successful Minecraft program. At 8 pm Dr. Farah Bennani, Lucas Gillispie and Chris Luchs will discuss Minecraft for STEM, particularly focusing on biology and computer science. This most likely will kick off the discussion of the Minecraft themed Hackathon. At 9 pm, Tanya Martin, Vasili Giannoutsos and Kae Novak from the ISTE SIGVE ( Special Interest Group- Virtual Environments) and Chareen Snelson will host an open discussion on Minecraft and Machinima. This will include what videos are students watching and where is the learning happening. On Saturday, we start at 2 pm with a discussion with leaders from the SIGVE, the Games MOOC, rgMOOC, VSTE, SIGML and Inevitable Instructors on Minecraft in learning. This will include brainstorming the Minecraft one page document and white paper and any other discussion that evolved during the UnSymposium on Friday. At 3 pm, we have a tour with Jokay in the Massively @ jokaydia server. Make sure you sent in your character name on Friday evening so that it could be forwarded to Jokay. At 4 pm, we have Trish Cloud for Q and A. We’ll start with how to setup a Minecraft Club at your school and then continue on to discuss mobile and Minecraft, coding and all things techy. 5 pm, we’ll do a basic building session with giraffe619 and mousymoose and Trevyn Slusser on the Games MOOC server. 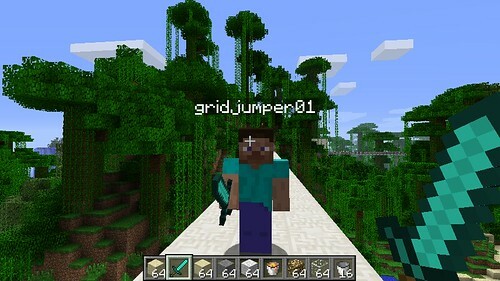 6 pm – 8 pm, we’ll have a Minecraft Challenge that the rgMOOC used for their Rhetoric class. During this building we’ll also be talking with Kristina Thoennes on Minecraft resources, Sherry Jones and Steve Getter on Minecraft in a community college class and have commentary from giraffe69 and mousymouse. At 8 pm, we’ll be wrapping up in Minecraft and will be heading over to VSTE Island (Virginia Society for Technology in Education) for a Minecraft themed social in Second Life. This will also be the online kick-off to the annual VSTE conference which starts on Sunday. If you would like to participate in events on the Minecraft servers, you will need to email games.mooc@gmail your Minecraft charter name. The servers are using version 1.6.4 so you will need to make sure your account is set to 1.6.4. To register please go to https://inevitableeducation.eventbrite.com/. Registration will be open until Thursday evening. This was a fully online collaborative event between the Games MOOC, Inevitable Betrayal Educator's Guild, rgMOOC, SIGVE and VSTE. This educational gathering was an opportunity for you to “assemble your entourage” or expand your personal learning network. It was for educators to build their social network knowledge creation. Hope to see you there and if not – hope to have a great discussion in social media. We'll be using the #gamemooc hashtag.